Home gardening is becoming increasingly popular as we learn more and more about the dangers of genetically modified foods. But did you know that many commercial fertilizers are made from ammonia, which is extracted from natural gas, or that the extraction process releases carbon dioxide? Even worse, nitrates in these fertilizers can harm humans and marine mammals by seeping into groundwater, and ultimately deplete the soil’s nutrients. Fortunately, most of us have the basic ingredients needed to make homemade fertilizer sitting around the house, including dried coffee grounds and unused vegetable matter, which can be used to create compost. 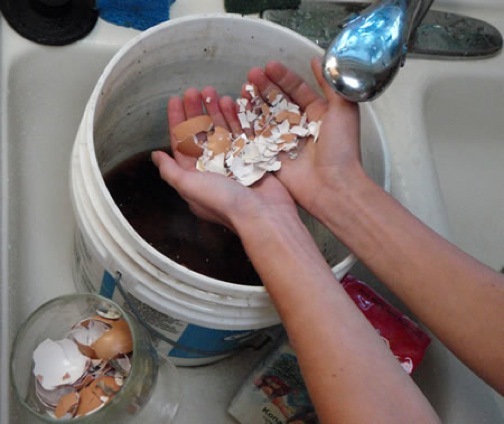 But one of the best tricks for all-natural homemade fertilizer is to use ground up egg shells, which consist primarily of calcium carbonate (or, in fertilizer terms, lime). In addition to the calcium carbonate, egg shells also contain small amounts of nitrogen, phosphoric acid and other nutrients.